Anne Rice, creator of the Vampire Lestat, the Mayfair witches and the amazing worlds they inhabit, now gives us the first in a new series of novels linked together by the fledgling vampire David Talbot, who has set out to become a chronicler of his fellow Undead. The novel opens in present-day Paris in a crowded café, where David meets Pandora. She is two thousand years old, a Child of the Millennia, the first vampire ever made by the great Marius. David persuades her to tell the story of her life. 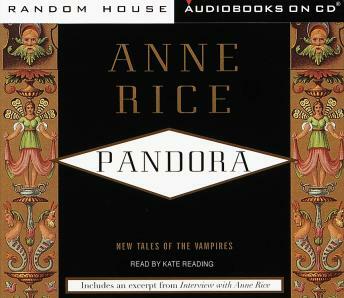 Pandora begins, reluctantly at first and then with increasing passion, to recount her mesmerizing tale, which takes us through the ages, from Imperial Rome to eighteenth-century France to twentieth-century Paris and New Orleans. She carries us back to her mortal girlhood in the world of Caesar Augustus, a world chronicled by Ovid and Petronius. This is where Pandora meets and falls in love with the handsome, charismatic, lighthearted, still-mortal Marius. This is the Rome she is forced to flee in fear of assassination by conspirators plotting to take over the city. And we follow her to the exotic port of Antioch, where she is destined to be reunited with Marius, now immortal and haunted by his vampire nature, who will bestow on her the Dark Gift as they set out on the fraught and fantastic adventure of their two turbulent centuries together. Look for Anne Rice’s new book, Prince Lestat and the Realms of Atlantis, coming November 29, 2016.